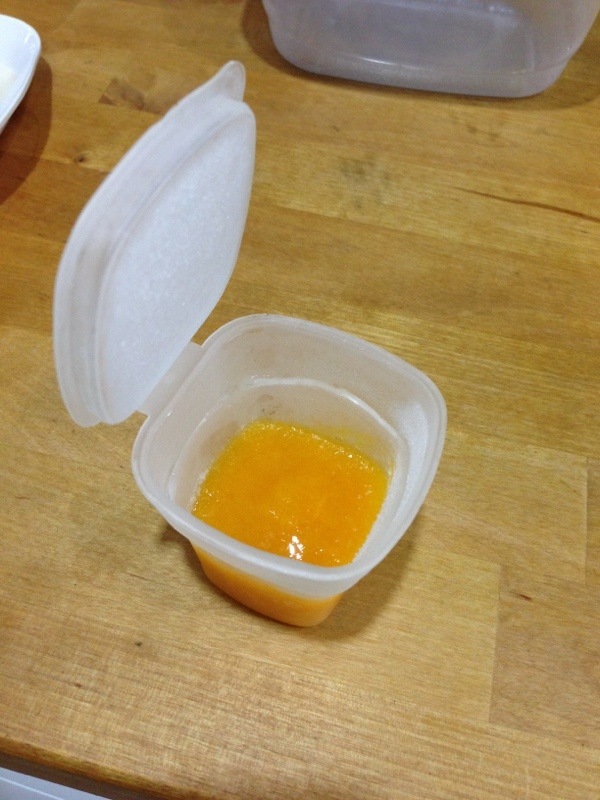 Day 91 : No new purée…. – Almond Milk. Preparing for BM weaning. It’s the first day of a new taste. 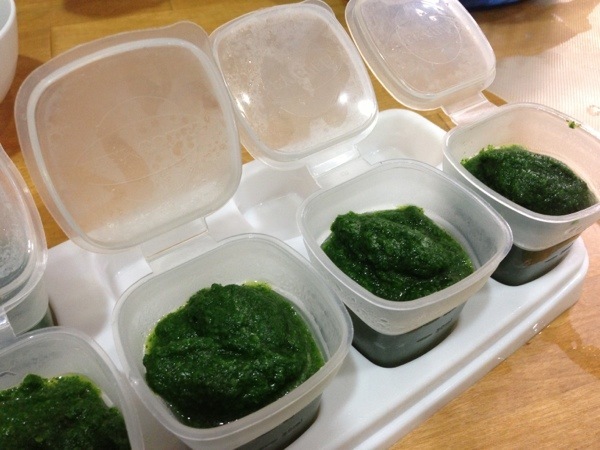 I wanted to serve some spinach to 小小宝贝 to “up” his iron intake, only to find that there’s no spinach in the refrigerator. It must have been cooked, eaten and fermenting somewhere in the sewers. Since my Dad specially bought organic Japanese pumpkin for his precious, I might as well use that. One small little slice cost more than $2!! I chopped it up into small chunks and steamed them for 15 minutes. 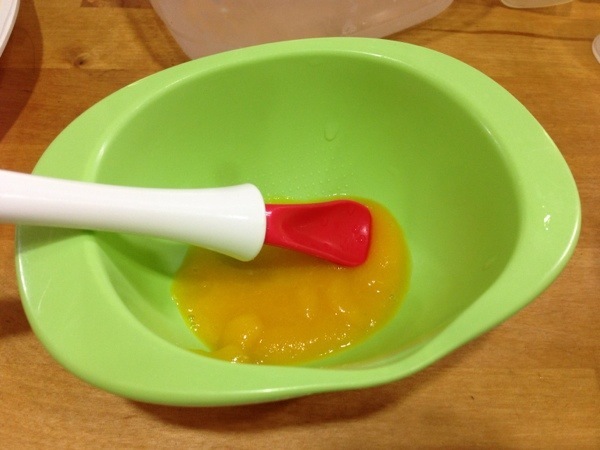 I added some water and blended the chunks into smooth orange purée. 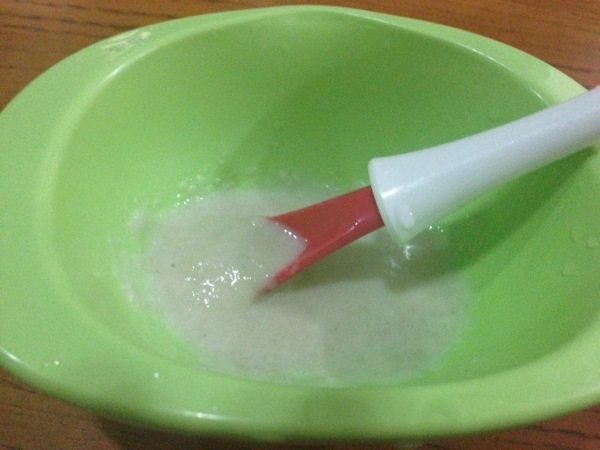 I tried some myself – yummy and sweet. 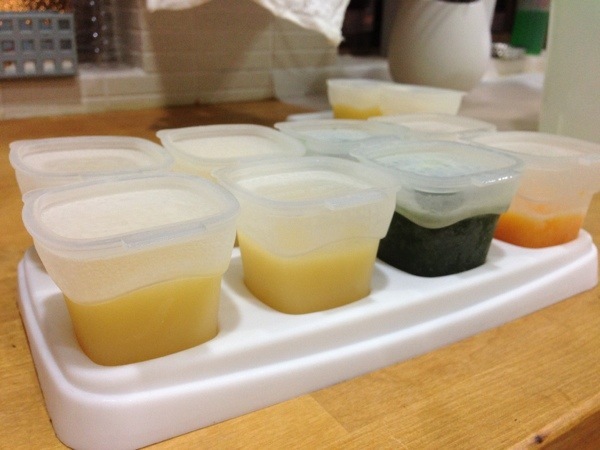 I froze 3 more portions in baby cubes so that he could have them for the next few days. 宝贝 insisted that it’s her favourite (which was really strange… I made chicken chop in pumpkin sauce for her, she declared that she hated pumpkin but still finished it to the last bit.) so she ate up the rest…. A good sleep after his pumpkin lunch. 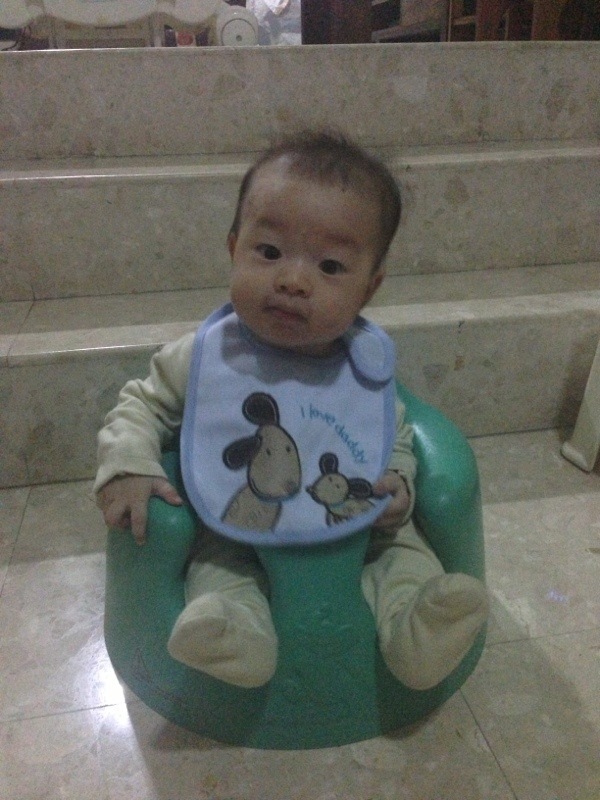 小小宝贝 is now 5.5 months old. I was trying to hold off the introduction of solid food to him til 6.5 months old. 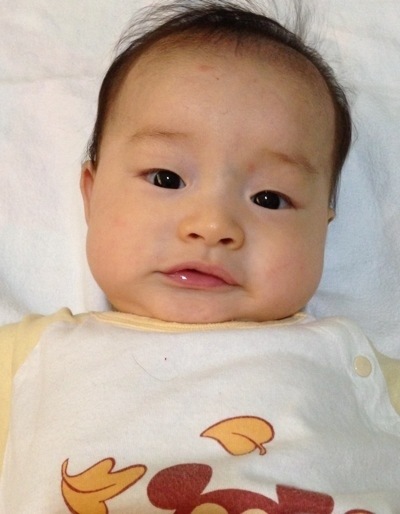 (宝贝 started on solid food at 6.5 months.). However, after the visit to the pediatrician this morning, it seems that it’s not possible anymore. The pd thought that he looked a little pale and checked the underside of his eye sockets, suspected that he may need more iron. 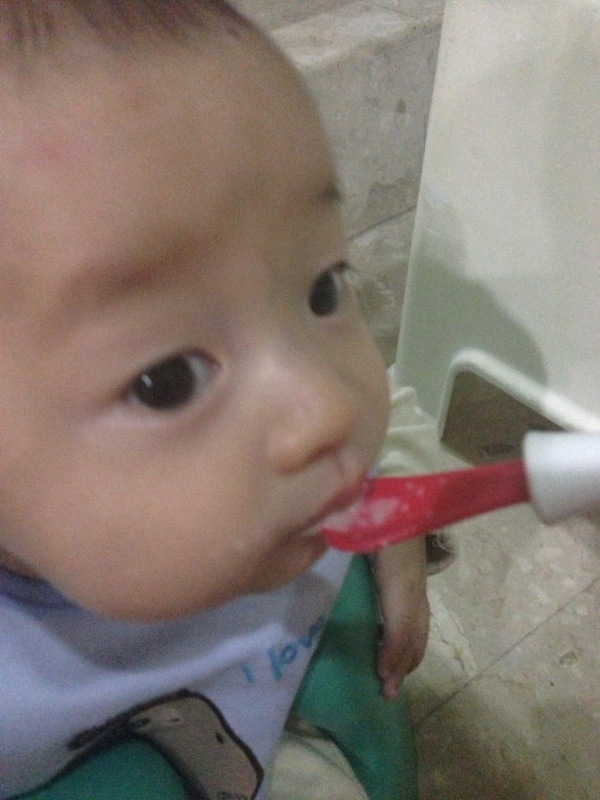 So he was prescribed iron supplements and I was instructed to start him off on his solids as soon as possible. As I sniffed his sweet smelling hair (after his bath of course! ), for the last time, I would be missing that. Even his poo (which smells sweetish because he’s fully breastfed) will start to stink. Sigh! He’s going to stop smelling like a sweet baby. He’s growing up ever so quickly. He doesn’t even fit into the curve of my body when I cuddle him now. To think he was so little when he was born. I miss my little baby. You are growing up way too quickly!